The backyard can be a great space but many people wish they had more privacy in their yard. There’s nothing worse than going outside to relax and hearing your neighbors’ loud dinner conversation out on their deck next door. Fortunately, there are several ways you can make your yard more private other than just installing a tall fence! Landscaping is a great natural way to make your yard more private and of course it can enhance the appearance of your outdoor living space as well. Softscaping which are the trees, plants, flowers, and shrubs in your landscape design, is one of the best ways to landscape for privacy. Planting large trees and tall shrubs and plants can enclose your yard and make it more private. 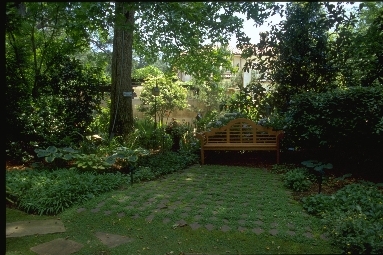 Many people choose layered softscaping and use a combination of trees and plants. The landscaping professionals at Hutcheson Horticultural can tell you which plants are best for your needs and determine the best placement to maximize privacy for your yard. Although pergolas and trellises won’t be able to hide your entire yard, they are good at providing privacy for your deck and/or patio. A covered pergola with a trellis or lattice framework can create an enclosed space that allows you—and any guests—to enjoy your yard in privacy. Making your yard more private and relaxing outside more enjoyable also involves masking noises. A water fountain or waterfall can muffle conversation from your next door neighbor’s yard, as well as block out other sounds like the buzzing outdoor AC unit or street traffic. Landscaping for privacy is easy with walls. Decorative walls can be used to block off your patio and enclose your space. This works especially well if your yard is sloped. Retaining or decorative walls with a fence on top can also add privacy to your yard. A covered or screened area on your deck or patio is another easy way to increase the privacy of your outdoor living space. It’s also a great solution for enjoying the outdoors without having to deal with bad weather and pesky bugs. For more information on creating more privacy in the backyard of your Atlanta home with landscaping call the Hutcheson Horticultural team at 770-924-1001 or use the convenient “Contact Us” feature on our website.